Med den här balunen kan man skicka en S-Video signal upp till 300 meter genom en vanlig Cat5e/6 nätverkskabel. The S-Video Balun allows one S-Video channel to be connected via two unshielded twisted pairs. 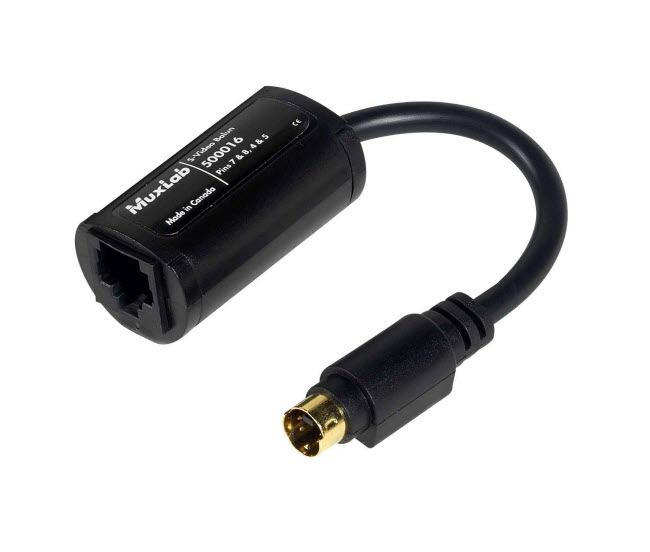 Used in pairs, the S-Video Balun is used in home or commercial applications as a smart, fast and cost-effective means of connecting S-Video equipment using twisted pair instead of coax cable. The S-Video Balun may also be used in conjunction with MuxLab's CCTV-Audio/Video Hub (500201) for video distribution to multiple monitors. Ideal for video-conferencing, audio-video distribution, S-Video and other dual audio-video systems.